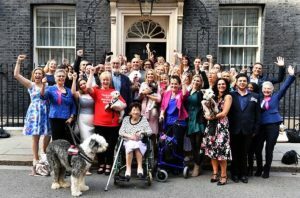 As the year draws to a close, we take a look back at Conservative Animal Welfare’s campaigns and events to help advance animal welfare in 2018. It has been a busy year in Westminster. We started off the new year with a joint parliamentary event in January with Compassion in World Farming and the Stop Live Exports Petition Team, kindly hosted by Craig Mackinlay MP to end live exports. The event was attended by over 50 MPs and supported by celebrities including Joanna Lumley, Selina Scott, Jan Leeming, Sir Ranulph Fiennes, Sir Frederick Forsyth, Stanley Johnson and Georgia Toffolo, winner of I’m a Celebrity, Get Me Out Of Here. This was followed by a Westminster Hall debate on live animal exports from the UK. 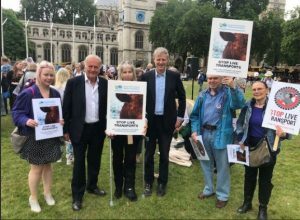 Our Patrons Sir Roger Gale MP, Sir David Amess MP, Theresa Villiers MP and Zac Goldsmith MP all put the case forwards to ban live exports for slaughter and fattening. The debate was led by Steve Double MP. 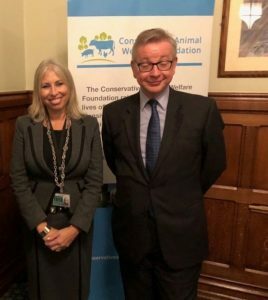 Our Co-Founder attended a private meeting with the Secretary of State Michael Gove in February to discuss advancing animal welfare.We urged for an end to live animal exports, the badger culls, puppy farms, an end to foie gras imports, fur imports and for a ban on wild animals in circuses and more. 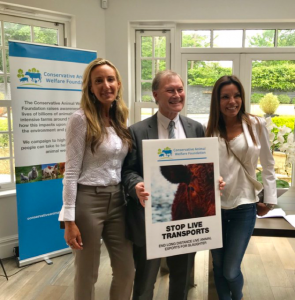 In May, we organised a further event with the Esher and Walton Conservative Women’s Organisation to end live exports and advance animal welfare with a speech by our Patron Sir David Amess MP. 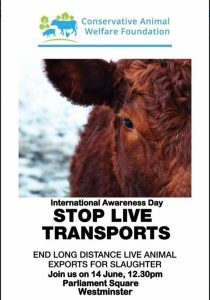 In June, we participated in the International Global Awareness Day to end live transports/ exports in Parliament Square with speeches from our Patrons, Sir Roger Gale MP, Sir David Amess MP, Theresa Villiers MP and Zac Goldsmith MP. 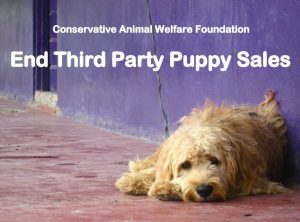 During August, our Co- Founder was invited by the Secretary of State Michael Gove to join a garden party at No10 Downing Street to celebrate the announcement of a ban on third party puppy sales which Conservative Animal Welfare Foundation has campaigned on to end puppy farms along with many animal welfare organisations. In September, we participated in the People’s Walk For Wildlife organised by Conservationist Chris Packham and walked from Hyde Park to 10 Downing Street to raise action to protect disappearing wildlife and their habitats. Our Patrons Lady Suzy Gale,Henry Smith MP, Zac Goldsmith and Sir David Amess urged for an end to the badger culls in our statement. We want to see an end to the culling of badgers which are a protected species. During the Conservative Party conference, we held a joint reception with the Conservative Environment Network ‘Brexit: Opportunities For Animal Welfare and the Environment hosted by Zac Goldsmith MP. Our speakers included Farming Minister George Eustice, Minister Dr Therese Coffey, Sir David Amess MP, John Flack MEP, Theresa Villiers MP, Zac Goldsmith MP and our Co-Founder Lorraine Platt. John Flack MEP, the Vice President of the European Parliament’s Animal Welfare Intergroup launched his ground-breaking book on animal welfare at the reception. 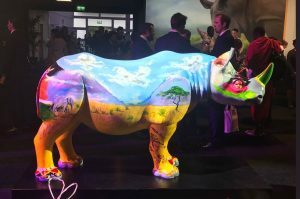 Later that month, we attended the Illegal Wildlife Trade Conference in London where World Leaders came together to end wildlife crime and protect endangered species from poaching and smuggling. The London Illegal Wildlife Trade Conference 2018 took place in London on the 11 and 12 October and Zac Goldsmith was the conference champion. In November, we joined Compassion In World Farming to deliver petitions signed by over 1 million people to Defra’s offices. 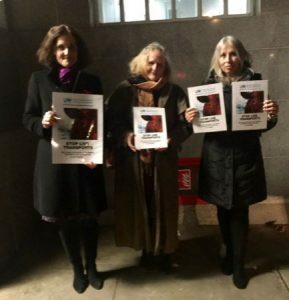 Our Patron Theresa Villiers once again called for an end to live exports outside the offices and spoke on the suffering animals endure in long distance live exports in her speech. 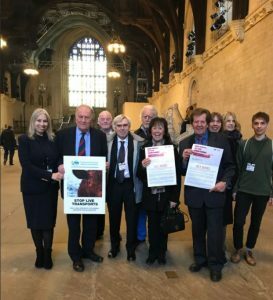 We have also been involved in supporting MPs with their Private Members Bills to advance animal welfare by sharing their campaign information on our social media platforms to help raise awareness and action for change. Ross Thomson MP has campaigned strongly against pet theft and to bring in legislation to ban electric shock collars. Sir Oliver Heald MP led ‘ The Animal Welfare( Service Bill) to protect service animals such as police dogs and horses. 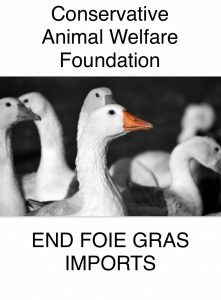 Our Patron Henry Smith MP led an adjournment debate to ban foie gras imports post Brexit and hosted a parliamentary event on the issue and on ending cages for game bird breeding. Our Patron Theresa Villiers worked on a Bill to end live exports for slaughter or fattening. 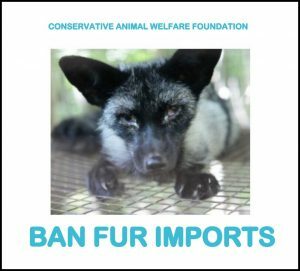 We were pleased to see MPs calls to end the UK fur imports in a Westminster Hall debate and scrutiny of the UK fur trade by the Environment and Rural Affairs Committee led by Chairman Neil Parish MP. Peter Bone MP put forward a powerful case to end industrial poultry farms in his Westminster Debate and talked on the suffering of sentient animals crammed together in dark sheds with no room to move or ever see natural daylight. Trudy Harrison MP called for an end to wild animals in circuses. Rehmen Chisti MP led a debate for the importance of microchipping cats in December and for cats to be reported in traffic accidents. Our Patron Zac Goldsmith led a debate on protecting our oceans and marine wildlife in the South Seas and Sandwich Islands, home to many important marine species. 2018 was the year that mandatory CCTV in slaughterhouses legislation was laid in Parliament and came into effect. We welcome The Agriculture Bill , a once in a generation opportunity to shape future farming policy and reward farmers who adopt higher animal welfare systems and enhance the environment. We are delighted that CCTV in all slaughterhouses came into effect in May 2018, as well as a ban on third party puppy sales and the Ivory Bill received Royal Assent and will come into being in 2019. We worked hard on these campaigns with our MP Patrons. The Government measures to reduce plastic waste which harm marine are also very welcome. Our aims for next year continue to include a ban on live animal exports for slaughter and fattening, an end to pig farrowing crates, cages for egg laying birds and for the introduction of method of production labelling. We are campaigning to ensure animal welfare isn’t compromised when we leave the EU and that our standards are protected and opportunities to advance animal welfare are maximised when we leave the EU. In our view, it’s important that all current animal welfare laws are kept to the same standard at the very least. We will continue to raise action to end cages for egg laying birds and confined pig farrowing crates, end live animal exports for slaughter and for the Introduction of Method of Production Labelling including method of slaughter. We also want to protect our Farmers from lower welfare imports as there is a possibility that new trade agreements could be made with countries which have lower welfare standards, ensure that UK animal welfare standards are not lowered when we leave the EU and that Animal Sentience is enshrined in UK law and that animals are recognised as sentient beings, when we leave the EU. Brexit also provides us with opportunities to ban fur imports and foie gras imports. Welcome all offers of support and please do contact us if you would like to be involved to help advance farm animal welfare on our contact page. Please also help spread our messages and aims on social media to help amplify our voice for change. We are pleased with the animal welfare measures that we have helped to achieve during 2018 but there is much, much more we need to do to help advance animal welfare in 2019. Below are a few pictures of some of the events we organised to advance animal welfare during 2018. We hope that 2019 is a prosperous Happy New Year! Next PostTheresa Villiers MP calls for an end to live animal exports as petitions totalling 1.3 million signatures, handed to Defra on 29 October.